From two weeks ago or something when the “Gilets Jaunes” or Yellow Vests movement began to gain attention worldwide with their protests rocking France , I received a WhatsApp message from a Pro-regime TV host and journalist saying that the protests were sponsored by the CIA and Trump as an answer for the French President Emmanuel Macron call’s for a European army. I laughed and did not pay attention then to the message as he is used to sharing those wild anti-Arab spring pro-conspiracy theories all the time. Tonight I found non-politicized friends on Facebook sharing the same post copied from each other, unfortunately, which means it began to spread. 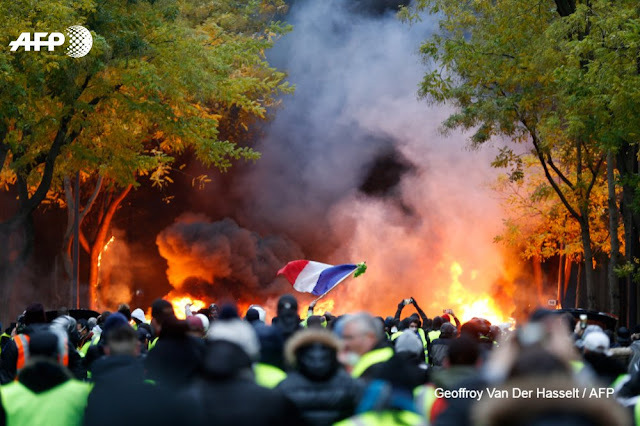 Yellow vests in Paris "AFP"
For the regime supporters, the CIA and Trump “whom they actually like” are not the only usual suspect to blame in that “violence” threatening the French republic. The Islamists or to be specific the Muslim Brotherhood are blamed also for the Yellow vests movement. Nabil Naim, the former leading figure in Islamic Jihad the so-called expert in the Islamists affairs told Al-Masry Al-Youm “AMAY” Daily that the Muslim Brotherhood members from Algerians, Tunisians and Moroccans who live in the shanty towns of France were participating in the violent protests. “The way that those protests are being managed show the Muslim Brother is behind them without a doubt !!! !” He said with all confidence. He also added that the CIA and Trump were behind those protests but they let the MB do their dirty work for them because Macron spoke about that European army. It is always the MB. Dubai former police chief Dhahi Khalfan also wondered if the Gilet Jaunes protests had to do with the arrest of Tarek Ramadan, the grandson of MB’s founder on charges of rapes and that the MB made up those protests !! I do not know if that man is playing dumb or he is dumb for real. Once an independent newspaper that supported the January 25 revolution, Al-Masry Al-Youm “AMAY” paper published a report about the negative similarities between Gilets Jaunes protests and the Arab Spring. According to AMAY, the similarities are murder, looting and destroying public and private properties only. The reasons or the results similarities between the two movements are completely ignored. It did not stop at there as those Pro-regime supporters expressing their gloat that Paris was burning openly “because Europeans always speak about protesters’ human rights and did not care for national security so they can drink from their own poison now” but it extended to share and explain news according to their own right-wing mindset “and directives as well” . For instance, Pro-regime supporter Media figure Ibrahim El-Garhi on December 2nd. In less than 24 hours , France will deploy its army to restore security in the streets and so our good kind people should know that in Europe and developed countries , armies are used in the necessities and no DOG says it is military rule. Well in less 24 hours of writing that pathetic Facebook post, French Prime minister Edouard Philippe announced that the fuel taxes rises were postponed for six months. Yes, the French government began to listen to those Gilet Jaunes who burned down Central Paris without sending the military to drag them down in the Champs-Élysées. He removed that post from his official Facebook page after it became the joke of Egyptian social media but he posted another interesting post on his Personal Facebook account, which he shared publicly to everybody. “The Arab Autumn” refers to the Arab Spring and “The glue sniffers” is a derogatory term referring to the Non-Islamist Pro-25 January protesters by pro-regime supporters describing them as drug addicts. Well Macron does not need to learn from the Arab Spring protests because his democratic country learned very well the meaning of Public anger in the famous May 1968 protests. Personally, I wish Mr. El-Garhey and his brothers read more about the political history of France before opening their mouth. By the way, Ibrahim El-Garhey gives lectures about media and social media in universities like the American University in Cairo as well in the military academy. I forget to mention in my post series about Media Empires in Egypt that Ibrahim El-Garhey was attacked in Egyptian Media group’s newspapers because he criticized how TV channels currently were full of symbols of ignorance as TV hosts. The former TV host used to have TV and radio shows in channels owned by the Group but they were suspended. 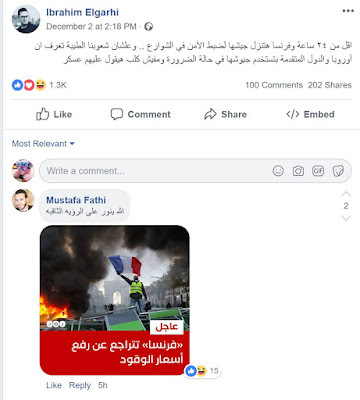 Also, I could not ignore that message from a Kuwaiti concerned citizen Adel Youssef to President Macron telling him to strip the French citizenship off some of the protesters who do not respect France’s history so the rest would stop protesting !! Needless to say, most replies were mocking such suggestion but the thing is Mr. Youssef mentioned a very common practice in the Gulf region, which is to strip political dissidents off their citizenship and nationalities to become stateless. It happens in all Gulf states without any exception whether in Saudi Arabia or Kuwait or Qatar or Bahrain or UAE. It is another weapon besides imprisonment, torture, abduction. Mr. Youssef represented honestly how the regimes in the Gulf region as well the supporters think when dealing with opposition. Sadly enough he and his compatriots in Egypt spoke about France and its great history, ignoring or forgetting the role the French people played since the 18th century in shaping the modern democracy as well republic as we know it. On Thursday, I began to read on Twitter rumors that the industrial security shops would not sell any yellow vests for construction companies or individuals except when they see a permit from a police station and official documents from the companies !!!!!!!! I totally understand the fear of Egyptian regime as well the Arab regimes in general that the Gilets Jaunes may give thoughts, especially we are near from the anniversary of Arab spring start in Tunisia and its proud baby “whether they like it or not” in January 25 revolution in Egypt but this is madness. They learned nothing from the Arab Spring. By the way, Pro-MB supporters are now sharing posts claiming that the French people are braver than the Egyptian people as a poor attempt to provoke the public as usual from them. I Just want to tell them that the Egyptian people went to the streets and died while knowing that there is no law or constitution to protect their rights, unlike the French people who are lucky enough to know they would protest and return back home safely. The Egyptian people are exhausted, a thing which nobody can deny. They are also very patient people but patience got limits, the world knew that in January 2011. "...the protests were sponsored by the CIA and Trump as an answer for the French President Emmanuel Macron call’s for a European army..."
Trump doesn't give a damn about Macron's European army plan. He couldn't even be bothered to give a languid thumbs down gesture, never mind sponsoring protests against it. If anything, he'd be for a European army, because for the past half-century or more they've been a whole continent of defense freeloaders. Making Europe pay their fair share of their defense was a Trump campaign promise, in fact. "It is always the MB." Far more likely the MB than Trump and the CIA.